7:54. Dragon Bane beat Draztick Boy with a 630 splash. 6:35. 1st defense. Faby won via German suplex. Lady Shani ran in to attack Faby post match. Taurus made his return to AAA to attack Shani, seemingly allied with Faby in this moment. 5:57. 2nd defense. Suicide won with a twisting shooting star press. 6:27. Parka submitted Dave with an armscissors. 17:33. Murder pinned Pagano after Taurus attacked Pagano. 9:54. 3rd defense, 2nd on TV. Samoano was with the rudos and interfered freely. Earlier, Psycho Clown & a doctor announced Psycho couldn't wrestle due to knee injury. 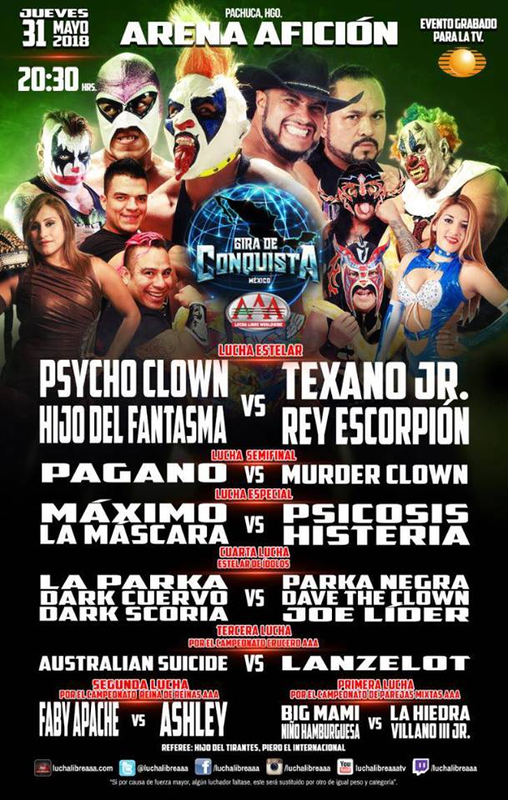 Fantamsa revealed he'd gotten this changed to a title match and would have a surprise partner. Taurus appeared and attacked Psycho for a second time. Pagano, wrestling two matches in a row, was Fantamsa's pick as partner - but Fantasma walked out on Pagano at the end of the match. 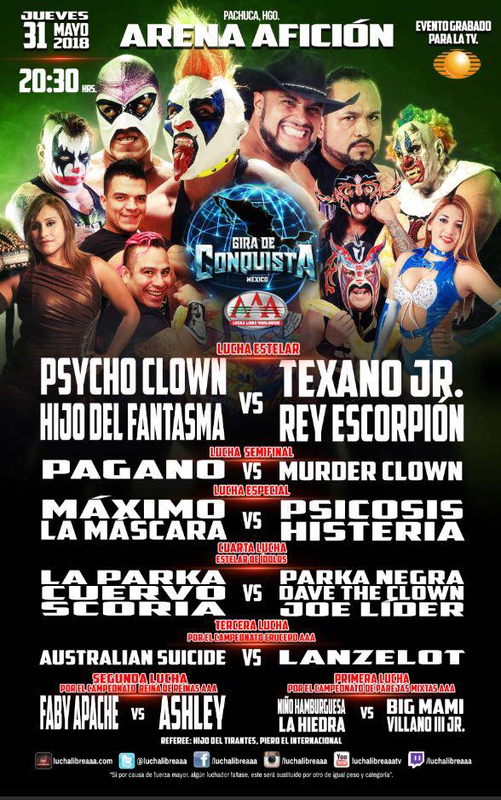 (Fantasma teased a rudo turn all night.) Referee Piero stopped the match after Fantasma left with no clear ending. 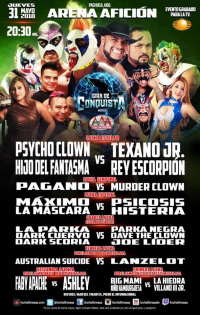 The camera cut backstage, where OGT & Poder del Norte got in a fight (PdN had beaten up OGT earlier), Fantasma & Psycho brawled, Pagano came back to fight Murder Clown, and the rest of the AAA roster tried to break up the fights. A masked MAD person (possibly Konnan) stood unnoticed backstage with a guitar.